It was a Sunday night, and I was in Ohio with my family. We decided to try a relatively new spot around the corner from my parents’ house – Frank and Pauly’s. The restaurant had opened in the old Sawyer House building – a building with tons of charm, and an eternally cool atmosphere. My words simply won’t do it justice. Just know this…The Sawyer House is on the National Register of Historic places as one of the only Stone Homes in Lake County. There are more pictures on their Facebook page. Because this was such a new place, I knew that I’d have trouble deciding what to order. 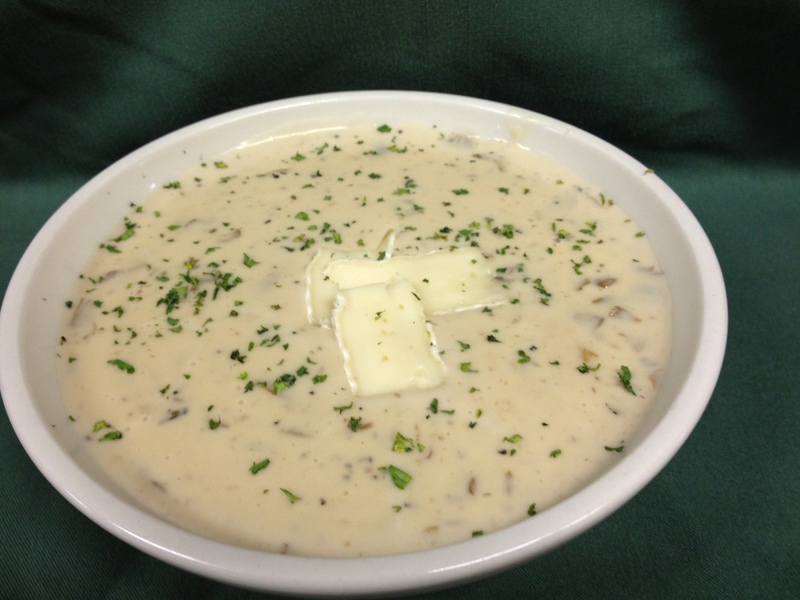 I did decide that I couldn’t pass up a cup of the delicious Sawyer House Mushroom Bisque (a house favorite made with real cream, Kill buck Valley Wild mushrooms, Shallots and sherry, topped with brie cheese). I love that Frank and Pauly’s kept the Sawyer House name as a tribute too. And, I have to give a huge “thank you” to Damion for sending me pictures of the food I experienced at Frank and Pauly’s – well after the fact. He was gracious enough to email me photos for this blog post. A true indication of the type of people we encountered at Frank and Pauly’s. Kind, generous, and accommodating! Speaking of great people, our server, Jason, was very engaging and happy to walk us through the menu a bit. He got quite nervous when I asked him to simply choose a dish for me, and to surprise me. Seeing the fear in his face, my mom started trying to guide him (nothing too large, something kind of light, etc), and I had to interrupt her and impress upon him that the choice was 100% his. Jason chose the Chicken Parmesan dinner for me. 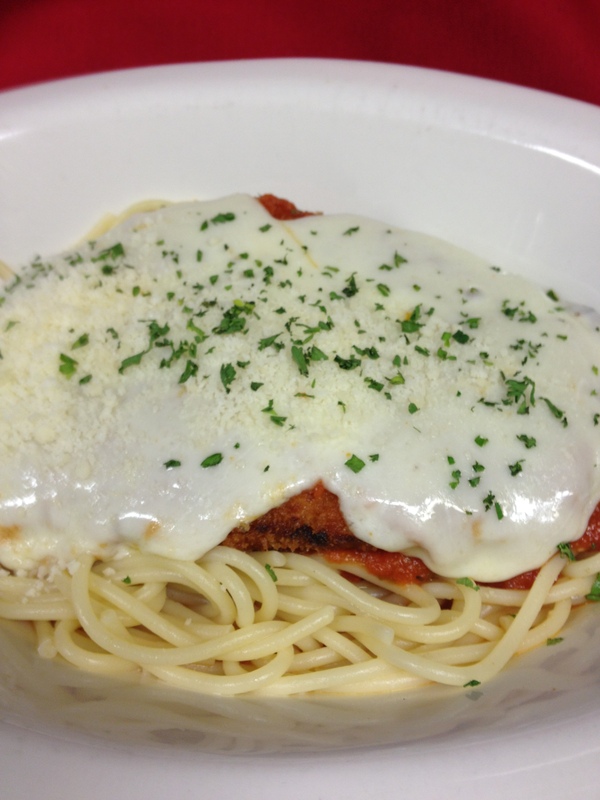 It was a huge dish – breaded center cut chicken breast, lightly fried topped with whole milk mozzarella and imported parmesan baked and served with our marinara sauce. It was cooked beautifully, had wonderful flavor, and filled me up about 1/3 of the way through the dish! Several times, Jason came back to see if I enjoyed his recommendation – and I really did. He also told me that had this been a Saturday night and he had encountered a customer like me, he would have had a full-on panic attack! He really felt the pressure to deliver. And, he did, for both dinner and lunch the next day! My family tried a variety of other salads and dishes, all very pleased with our meals, and with the service. We had a truly wonderful experience at Frank and Pauly’s. I’m looking forward to going back to try something else on the menu! If you’re in Lake County, I suggest trying Frank and Pauly’s sometime. Delish! You keep going to great spots near me! I loved Frank and Pauly’s when it was downtown ages ago and can’t wait to check it out in its new location. In the interest of full disclosure,Jen, I’ve had a couple of people tell me the service needs improvement. However, we had great service! Frank & paulys fired that great chef, they brought in a new guy and the food quality died there, its horrible now. We both had walleye special got very ill.
That’s a total bummer to hear, Morgan. This was actually one of my most controversial posts – with one reader getting slightly nasty because we had very different experiences at Frank & Pauly’s. I will certainly call attention to the change on my Facebook page, as I had recommended this spot to a few people who were on the fence. Thanks for reading the post, and especially for leaving the informative comment! Total lie above. I was the “New Guy” they brought in from August 17-November 1st. The Walleye Special we ran which was pretzel crusted walleye in a white wine lemon beurre blanc sauce was received well by all those who had it and we had guests on the website ask for us to bring it back. They never had a “great chef” there before. I walked in to a Kitchen Nightmare. I power washed the entiire walk-in as it had mold inside. All collers were molded and had rotten food. I fired the entire kitchen staff. There was no fresh food in the restaurant, all canned and dried herbs. I trained at The Culinary Institute Of America and worked at many high end restaurants in Cleveland, Jacksonville and Boston. I put in a new menu with all fresh ingredients. A menu that customers raved about. The walleye in question was bought fresh from Euclid Fish Company and we sold out that very night. It was pan seared then finished in the oven and tested for temp with a digital thermometer. Classic textbook procedure. I put a new menu in two days after this poster wrote the comment. I left because the owner would not provide me the equipment to keep the kitchen. Sanitary, including coolers and refrigeration. Thanks for reading the blog, and for leaving a comment. As I mentioned, I had a very good experience at Frank and Pauly’s, but I had been told others had poor experiences. I’m not sure of the timing of all of the feedback, but I got the sense it was before the changes were made (e.g. prior to your coming on board). In any case, I appreciate that you were willing to provide feedback and context. I hope you’re enjoying wherever you are cooking now!